Being often described as cute pets because of their many peculiar habits they make excellent family pets, they communicate by making numerous sounds that all have different meanings and often jump in the air, a sign that a guinea pig is happy. Easy to handle pets, who prefer a routine, you will observe that they will prefer a regular time for play, mealtimes and rest periods each day. They are playful inquisitive animals who like to hide in boxes, but will readily appear when anyone approaches their cage, chewing an gnawing are a regular feature of their daily routine, always have Chew Sticks For Small Animals, available to allow them to Gnaw on, keeping their teeth in good condition. As their teeth grow continuously and chewing on hard wood or chew sticks keeps them in check. 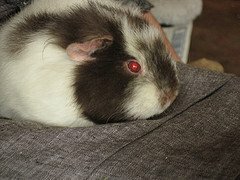 It is normal for a guinea pigs teeth to be yellow and cleaning is not necessary. If your pets teeth or nails seem too long it will be necessary to consult with a veterinarian. A well balanced diet which should consist of high-quality guinea pig food, 1st Cut Timothy Rabbit and Bunny Hay and limited small amounts of vegetables and fruit. They will require a daily intake of 30 to 50 mg of vitamin C either by vitamin supplements Oxbow Daily C Tablets - 90 ct or from citrus fruits, fresh chlorine free water that is replenished daily. Avoid sugary and high fat treats. Never feed chocolate, caffeine or alcohol as these will cause serious health problems. Remember that only small portions of vegetables and fruits should be given to your pet on a daily basis, any uneaten food should be removed from the cage after 24 hours, always feed fresh food and clean water. Adapting well to normal household temperatures, providing they do not exceed 80 degrees F Guinea pigs will quite happily live indoors where you can give them plenty of attention. A cage approximately 30”Lx15”Wx15”H, which is escape proof, with a deep solid base, to allow for 1 to 2 inches of floor covering and bedding is advised although giving them more room is advisable as they need plenty of room for play and exercise, avoid any positions in the house where the cage would be placed in direct sunlight or near windows where there may be a draft, sudden changes in temperature should be avoided. Cleaning of the cage at least once per week and daily removal of damp spots is recommended. Remove your guinea pig/s and place them in a secure box while you tend to the cleaning of the cage. Remove and dispose of bedding, wash out the base of the cage with a mild soap and water, allow to dry, wipe over the wire and thoroughly scrub the feeding bowls and water bottle, when every thing is completely dry replace the bedding and floor covering and place your pig/s back in their fresh cage. Maintaining a regular cleaning practice will keep your pets healthy and avoid any unwanted odors. Generally clean little animals that do not require bathing often, you can do a little spot cleaning when needed with a damp cloth or unscented baby wipe. Grooming with a soft backed brush will keep their fur in good condition, while grooming you will be able to check the general condition of your pet. active, alert, and sociable, good appetite and drinks regularly, bright clear eyes, healthy clean fur, clear breathing no snuffles, mobile walks without restrictions, and communicates with varied squeaking sounds. weight loss, abnormal hair loss, diarrhea or dirty bottom, distressed breathing, lethargic, eye or nasal discharge, skin lesions, overgrown teeth. If at any time you are not happy with the condition of your pet you should seek professional help. Being a nervous creature they need to be handled gently, they are quite fast and the temptation to grab them is a normal reaction, doing this will only make it even more difficult to build up trust. Instead be calm when approaching the animal, place your hand under the pets stomach and scoop him up place your other hand on his back to prevent him from wriggling, hold him close to your body so that he feels secure. If you have selected a long haired variety then you will need to groom them to avoid their hair becoming clogged, short haired varieties will generally take car of their own grooming.